The 2013 Preakness Stakes was the 138th running of the Preakness Stakes thoroughbred horse race. The race was held on May 18, 2013, and was televised on NBC. The race was won by Oxbow. The post time of the race was 6:18 p.m. EDT. The race was the 12th race on a card of 13 races. 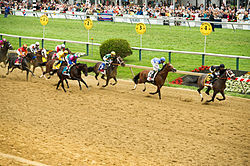 The Maryland Jockey Club reported total attendance of 117,203, the second highest attendance for American thoroughbred racing events in North America during 2013. "The Middle Jewel of the Triple Crown"
Oxbow (far right) leads into the straight during the early stages of the Preakness Stakes. 2013 Kentucky Derby winner Orb as expected entered the Preakness. It was announced on May 6 that Vyjack and Normandy Invasion would also be starting in The Preakness. Other Derby starters confirmed for The Preakness are Goldencents (17th) and the D. Wayne Lukas trained duo of Oxbow (6th) and Will Take Charge (8th). Later connections of Vyjack and Normandy Invasion withdrew their nominations. Horses that did not start in the Kentucky Derby and were nominated include Illinois Derby winner Departing, Sunland Derby winner Govenor Charlie and Titletown Five. Nine 3-year-olds were entered for the 138th Preakness Stakes. The post position draw was held at the International Pavilion in the Pimlico Infield at 6 p.m. on May 15, 2013 and were broadcast live on Horse Racing TV using a blind draw. After the draw Orb was installed as the even money favorite, securing the rail. Oxbow was trained by D. Wayne Lukas (right) and was ridden by Gary Stevens during his Triple Crown campaign. Stevens is pictured wearing the colors of Oxbow's owner Brad M. Kelley. On the day of the race, the Kentucky Derby winner Orb was bet down further from even money of 1-1 on the morning line down to a prohibitive odds-on favorite at 3-5 by post time. Florida Derby runner-up Itsmyluckyday was listed as a distant second favorite at ​8 1⁄2-1 while Santa Anita Derby winner Goldencents was the third choice at almost ​9 1⁄2-1 by post time. Oxbow was relegated to longshot status of almost ​15 1⁄2-1, the only horse with longer odds was stablemate Titletown Five at 22-1. At the break Oxbow was brushed by Will Take Charge, and then steadied as Goldencents, Oxbow and Titletown Five rushed out to the lead in that order. Orb broke well in sixth place out of nine stakes winning colts. Passing the stands for the first time Oxbow moved to the lead and led by one and one half length over Goldencents completing the first quarter mile in a slow :23-4/5. Making a point to ride three to four paths off the rail Oxbow's jockey Gary Stevens slowed down the pace of the race. Rounding Pimlico's famous "Clubhouse Turn" Oxbow opened a daylight advantage moving ahead by two and a half lengths tipping the clock at :48-3/5 for the first half mile. At this point Orb was running in fifth place only two lengths behind Oxbow. Racing down the backstretch and entering the final turn Oxbow's lead dwindled to only a length and a half with Goldencents and Itsmyluckyday within striking distance. At the top of the lane Oxbow hit another gear and widened his lead to three lengths over Itsmyluckyday who went six wide and made a menacing run toward the front. The first mile was completed in 1:38 flat on the front end as Derby winner Orb toiled in sixth place. Nearing the wire, Oxbow, under some hand urging by Stevens, held on to win by one and three quarter lengths over Itsmyluckyday. Louisiana Derby runner-up Mylute closed from the back of the pack under Rosie Napravnik to finish third by two and a quarter lengths (the best finish ever by a woman jockey in the 138-year history of the Preakness). Kentucky Derby winner Orb made up some ground at the end but could finish no better than fourth, nine lengths behind the winner. Just after the wire NBC announcer Tom Hammond exclaimed, "Gary Stevens just stole the Preakness," with Oxbow becoming the first wire-to-wire winner of the race since Aloma's Ruler in 1982. The "Hall-of-Fame ride" allowed Oxbow to conserve enough energy to finish the mile and three sixteenths in a final time of 1:57.54; it was the slowest Preakness winning time since 1961. Winning jockey Gary Stevens became the oldest jockey at aged 50 years to win the race. Winning trainer D. Wayne Lukas won his sixth Preakness to move one behind Robert Wyndham Walden for most wins in the second leg of the Triple Crown and won his record fourteenth Triple Crown race. ^ "The Preakness Home Page". Maryland Racing. Retrieved May 5, 2013. ^ 2013 Preakness Stakes Media Guide; page 97. ^ a b c d e f "12th Race, Pimlico, May 18, 2013". Equibase. May 18, 2013. Archived from the original (PDF) on May 19, 2013. Retrieved May 18, 2013. ^ "Kentucky Derby 2013: Orb wins, heads to Preakness chasing Triple Crown". The Sporting News. The Associated Press. May 5, 2013. Retrieved May 5, 2013. ^ a b "Two Derby runners eye Preakness". BloodHorse.com. ESPN. May 7, 2013. ^ Martin, Kevin. "Preakness Stakes : Orb Pursues Part Two Of The Triple Crown". CBS WBZ-Boston. Retrieved May 15, 2013. ^ a b "Departing, Mylute, Govenor Charlie Set For Arrival". Maryland Racing. Retrieved May 15, 2013. ^ Ginsburg, David (May 15, 2013). "Orb draws rail as 1-1 favorite in Preakness". The Associated Press. Yahoo Sports. Retrieved May 15, 2013. ^ a b c Daily Racing Form, May 19, 2013 Preakness Stakes Chart. ^ a b "Oxbow wins, Orb 4th at Preakness". espn.go.com. May 18, 2013. Retrieved May 19, 2013. ^ Steve Silverman (May 18, 2013). "2013 Preakness Winner: Gary Stevens Writes Script Hollywood Wouldn't Buy". Bleacherreport.com. Retrieved May 18, 2013. ^ Richart Rosenblatt (May 18, 2013). "No Triple Crown: Oxbow Upsets Orb at Preakness". The Associated Press. ABC News. Retrieved May 18, 2013.